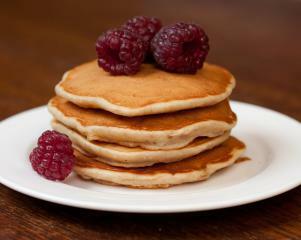 Pikelets are like small thick pancakes and are the stuff of Australian school kids lunchboxes. They are a great way to use up over ripe bananas and are quick and easy to make. Put a frypan onto a low heat. Mash the bananas. Mix together all the dry ingredients in a bowl. Add the banana, oil, vanilla and half of the soy milk to the bowl and mix together until smooth. The batter should be thick like a cake batter, if you used medium bananas you will probably need to add the remaining soy milk to make it this consistency. Add a little oil to the frypan to grease it. Add 4 lots of quarter cup batter to the pan to make 4 pikelets. When bubbles appear in the centre (about 1 minute) gently flip and cook for the same time on the other side. Remove the pikelets from the pan and repeat with the remaining batter. Serve warm or cold with jam or sliced fruit.